This week I was thrilled to receive a couple of emails from Lee and Sharon. Both of these ladies wrote to show me what they had made. And there's nothing I like more than to see quilts made using a pattern or tutorial from my blog. It isn't very often that someone takes the time to send me a photo of a quilt they have made, but these two emails came within just 12 minutes of each other. I was so excited and asked if they would be willing to have their quilts shared with my readers, so here they are! "Hi Lorna. I thought l would give you some feedback and a photo as often designers and pattern writers never get much feedback. I brought your pattern Jungle Friends 3 Jan 2016 and just made a small quilt up over weekend (Aussie time) and l must say your pattern writing skills are excellent. It was such an easy pattern to follow it made cutting and piecing a breeze. I really enjoyed creating my version using your pattern. Here is a photo and aside from the quilting and a binding it is all but done. Current size is 42" x 54". Cheers, Lee Vause "
Lee Vause does not blog, but does have a website where she offers her services as a longarm quilter here at Threads and Tangles. I was impressed with the arrangement of her animal blocks. Lee used the block sizes to determine her own unique layout! 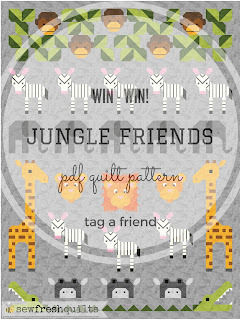 The Jungle Friends quilt pattern is available for purchase in my pattern store here. Sharon Naylor followed my GenX-Aztec quilt tutorial to make this handsome quilt for her "yet-to-be-born" grandson. And explained that she found this cute bow tie backing fabric first. And then chose matching Kona Cotton Solids for the front. "Hi Lorna. I thought you might like to see the GenX-Aztec Baby Quilt I made using your pattern and tutorial. This quilt will be a gift for a grandson due in April. The backing is in the bow tie fabric. I decided to make the borders differently. I hope you like it." I have been known to do that, too! It is so much fun to work a quilt from the back to the front. Have you ever designed a quilt starting with the backing fabric? Sharon wrote back to me the next day. Apparently she had purchased the Modern Charm quilt pattern. And sent along photos of her rendition of this fun quilt. I thought I would also share this one. It was finished in the summer. Hope you like it." I would love to hear from you and would be happy to show off your item here on the blog! This giveaway is soon closing. Winners will be drawn on January 15th! See the finished quilt and ENTER in the GIVEAWAY! All three are bright and vibrant quilts, but my favorite is the Gen-X-Aztek. The bow tie fabric on the back is so cute. Lovely surprises for you! Your patterns are always beautiful and I'm not surprised that many persons use them. I often see a rendition of one of your quilts on various blogs. I wish you a good cold-January day! Thank you for sharing these beautiful quilts. I always love seeing what others are making. I've been making a few baby-sized quilts. Two are for my granddaughter, again :)! 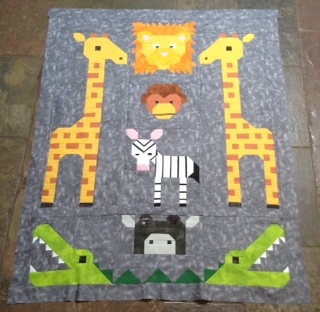 I love making smaller quilts and am looking forward to making your giraffe pattern Lorna, once I find the Quiltmaker magazine. It love seeing patterns in different colorways, each of these quilts are wonderful! How awesome that they contacted you to show you what they created. Both did an amazing job. What lovely feedback and quilts! How wonderful these ladies shared their quilts with you! I can only imagine how gratifying that must be for you!! There's nothing like seeing your quilt patterns made up by someone else! There isn'a a better complement a quilter can pay to a pattern designer. For me, seeing the different fabric, border, and quilting choices are always an inspiration. So happy for you! What lovely quilts these ladies have made. It must be amazing to see your designs interpreted in so many different ways by so many different people. Lovely finishes! Thank you for continuing to host this year, Lorna! So great to see all the versions of your patterns from the studios of other quilters!! It's fun to see your quilt patterns in quilts from others. I haven't done it often but have enjoyed using backing fabric to plan the front of a quilt. It makes me confident in my color choices and makes the back and front tie together so well. That bow tie fabric is adorable! These are beautiful renditions of your patterns. I enjoy seeing your patterns and tutorial made by your customers. Please continue to post them! Lorna, I bet it is so gratifying to see what others have done based on your patterns. What a great idea to share them here. A win for the maker and the pattern designer. Wonderful quilts. Thanks for sharing. Those are all beautiful renderings of your patterns. Thanks for the linkup!